The more technically-minded readers may need to know that I always use equal temperament. Longer distances are not impossible, and travelling further can add to the cost, but sometimes, I can save you money by finding ways of making an antique playable, without major expense. I still return to Essex occasionally, where I used to live. The usual fee was based on a survey of tuners across the UK, and is currently set at £59. Of course, some old pianos would not sell for as much as that, so it is often a labour of love tuning and maintaining an old instrument, whether you are preserving a family heirloom, or just delaying more major expenditure on purchasing another piano. We can arrange monthly payments in the form of donations to our website. If you find a cheaper-than-average tuner, it is worth asking yourself whether they know what they are doing, or whether they have simply made a business decision to undercut other professionals. If you have ever had trouble tuning a 6-string guitar, a 12-string is much more of a problem, so imagine what it would be like to manage 35 times as many strings, 12 times the tension on each one, and a much less user-friendly tuning system. Tuning a piano in an hour is a lot harder than you might think! Pianos are a combination of wood and metal, and they are affected by temperature and humidity changes, but also by atmospheric pressure, and once the tuning shifts, it will never return perfectly to its previous position without tuning. Another important factor is how heavily you hit the keys, because regular light playing has no perceptible effect on tuning, but heavy playing can knock it out in one session, especially in an old piano. As a rough guide, most pianos drop in pitch more in a year than they can be raised in a single tuning, so they usually need more than one tuning per year, and many people opt for twice a year. Surprisingly, because of climatic changes, pianos can also go up in pitch, over-all or on individual strings. What is interesting is that, using modern tuning meters, it is still possible to see the effect that the tuner has had even after several years, and it is often quite obvious if an amateur has tried to do the job previously, because the relationships between notes are incorrect. One Suffolk “tuner” seems incapable of tuning any F# correctly: all the F#s are in tune with each other, but out of tune with the other notes. If he used the proper crosschecks, this would be an impossible mistake to make. If a piano is shaken about on a van, and taken into a different environment, the tuning will often be quite unstable, and it needs to “settle in” to the new conditions of temperature and humidity before tuning, but opinions vary greatly about how long it takes to settle. If it has been badly neglected in the past, or is noticeably out of tune, it makes very little difference how long you wait, it may take several tunings to get it to its absolute best. A piano warranty often specifies that a new piano must be tuned 4 times during the first year. I would not take that as rigidly tuning it every 3 months, it may be better to start at 2 months, and gradually increase to 3, 4, or 5 months. A new piano with very tight tuning pins will probably be quite unstable if it has been neglected, and may need more tunings to stabilise it, but should have a longer tuneable life. For example, my piano compositions on our Demos page were recorded on 2 pianos that I tuned before the session, but they had been neglected, so the tuning was still moving while I was recording. You can sometimes hear this on album recordings of long classical pieces, and there was an occasion when I tuned a theatre piano for the Royal Philharmonic Orchestra but it had been so badly neglected, it was very unstable. An older piano may have tuning pins that are much easier to turn, and the tuning may be quick and easy, and reach stability in one or two tunings, but if the piano has reached an age of 50 or 60 years, some pins may be too loose to hold in tune, and this can cause random strings to suddenly drop badly out of tune, so the one note produces 2 or 3 different notes. This extra movement also causes metal fatigue, making it more likely that strings will break, and complete restringing can cost more than an old piano is worth. 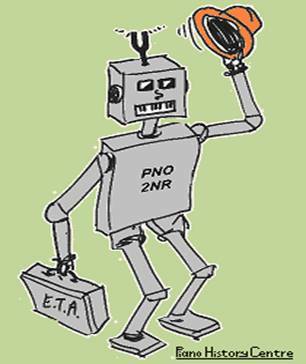 Some people think they can set up in business without training, and use an electronic tuning device, but some of the machines are so fussy, it can take 2 minutes to tune one string, that’s about 7 hours to tune a piano through just once, and tuners often have to go over some areas several times. Having a tuner working in your house all day long would be a nightmare! Some even use a little guitar tuner or a phone app. Those devices can be very useful for checking the pitch, but they are not as accurate as a tuning fork on a single note, the relative pitch between notes is not as accurate as a piano tuner, and anyway, they only help with the listening part of the job. The physical technique for tuning a piano, and making it hold in tune in an hour or so, takes years of training and practise. Tuning a piano string is not like tuning a radio, unless you are old enough to remember how Radio Luxembourg used to wander! An untrained tuner may try to raise the pitch a large amount, without any knowledge of the problems and damage it may cause. Many old pianos have not been maintained regularly, so even if they are tuneable, the over-all pitch of the piano may be lower than the standard pitch, and it may not be possible to raise it in a single tuning, if at all. This is important if you are a singer, or in the minority (perhaps 1%) who are cursed with “Perfect Pitch”, or if you want to play along with other instruments or recordings. Most pianos you are likely to come across (outside a museum) were originally built to be capable of tuning to modern pitch, but if it has been neglected, it may be too risky to bring it up in one tuning. My approach to this is to raise the piano's pitch a little each time, in the hope that it may eventually come up to pitch. (By “a little” I mean an eighth of a semitone.) Raising it suddenly by a large amount may cause strings to break, or other damage which adds to the cost. If the pianist knows how to transpose into other keys, an alternative is to keep it tuned so-many semitones flat, so that it can be played with other instruments. Another thing is that some cheap, under-trained tuners do not do even the simplest, most basic of repairs and adjustments. When I take over from some tuners, I find that there are all sorts of simple little problems that have been annoying the pianist for years, and which I would have dealt with automatically. People who have their pianos tuned regularly by me do not usually suffer any major problems with pedals, regulation or toning, because I try to deal with wear gradually, as part of the regular servicing. I also do what I can to minimise the risk of string breakage although, in an old piano, it is more likely to happen during tuning than at any other time. Recently, I was surprised to see a quite considerable amount of moth damage in a modern piano. Such problems, which used to be commonplace, rarely occur nowadays. Most of us, though, will come across pianos ruined by heating or sunlight, so that the piano's wrestpins (tuning pins) are not tight enough to hold in tune at all. Nobody can answer this until a tuner has a look at it and tests the pins. Do, please, read my page on central heating damage. In the real world, this would result in the treble sounding flat and the bass sounding sharp, so part of the tuner’s ART is to stretch the octaves slightly, although this is not an exact science, and not normally done by measuring frequencies. Piano tuning requires far more intensive training than that of any other tradesman you are likely to bring into your house, yet it rarely charges as much as the others. Tuning often takes about an hour, and the quieter the surroundings, the better a tuner can work. 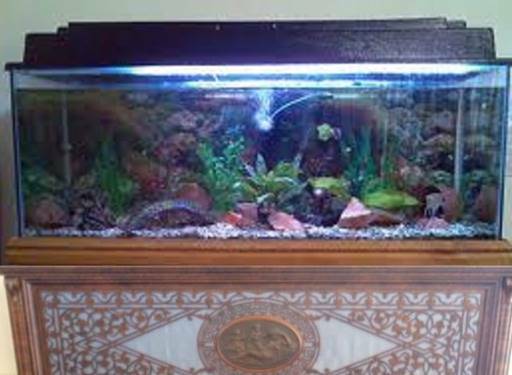 One customer had cut away the brickwork in order to wedge the piano tightly into an alcove, and failed to realise that the tuner needs the top to be opened, so you’d better start emptying that 20-gallon fish-tank! Music, and sounds of definite pitch (such as vacuum cleaners or electric drills) are impossible to work with. Random high frequencies or hissing sounds (white noise) are also a major problem, but the boiling of a kettle (pink noise) has actually been known to improve performance. Any loud or rhythmic sounds such as hammering, or a barking dog, will interfere with a tuner’s job. For me, the company of dogs and cats is a bonus, and I am fascinated by the correlation between musicianship and dog ownership. The level of concentration required for piano tuning is, in a way, quite out of proportion to the importance of the task, and has been compared to Transcendental Meditation, so what can seem like an endless torture of ‘orrible noises to a customer may pass very quickly for the tuner, unless the piano is troublesome. I find that customers fall into one of two categories: they either fall asleep from boredom, or have to leave the room because they can’t cope with the repetitive donging, I am not sure what all this reveals about the person. I can’t believe how many women have told me... “I’ll be in the bedroom if you want me” and then got very embarrassed about the way it came out! Perhaps they were confusing me with another tuner who sometimes spends as much time in customers’ bedrooms as he does tuning! If you are buying a cheap secondhand piano, ideally you should not spend all of your money on the basis of what it might be like after restoration or repairs. Instead, pay for a piano that plays and sounds as you want it to NOW. Otherwise, save half of your budget for possible repairs. Exterior finishing is a different matter, but don’t pay for re-polishing or anything else until you have brought in a tuner to check that the piano will hold in tune. If it doesn’t, the repairs may cost over a thousand pounds, which is often more than the piano is worth. At a time in history when every town had a great many pianos within walking distance, it was quite common for blind people to be trained to become “tunists”. Professional tuners make very little use of their sight when they are working, so a blind person is quite capable of focussing on the sounds without having to see, whereas a sighted tuner has to learn to block out the visual distractions, and concentrate on hearing. I trained alongside several blind or semi-sighted people. 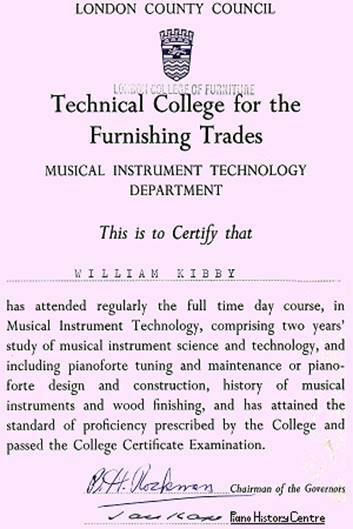 In 1963, I joined the Musical Instrument Technology course at the London College of Furniture, specialising in piano tuning and repairs. People often ask “why a furniture college?” and the main reason was the wood-finishing aspect of the training. I spent one afternoon a week for two years learning that you can’t learn the difficult art of French polishing in 2 years if you are just doing one afternoon a week! 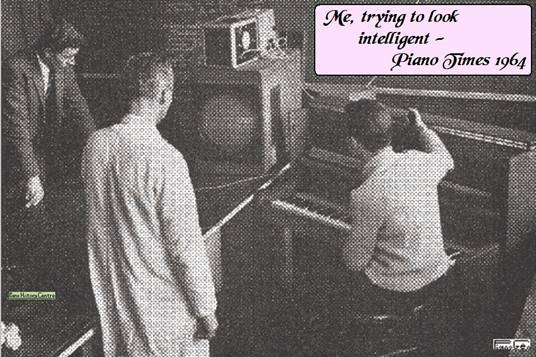 In 1964, I received the Challen First Prize for the outstanding student, and this picture of the back of my head appeared in the Piano Times. I was also nominated for the Broadwood Scholarship, but unsuccessful. I probably blew my chances at interview with the Worshipful Company of Musicians by uttering a stream of four-letter words, such as “Beat”, “Rock”, “Gigs” and “Jazz”. In 1965, I received the college certificate for Musical Instrument Science and Technology, including pianoforte tuning and maintenance, etc.. I went on to work for Berry Pianos, the largest group of piano retailers in London, doing sales and tuning at a dozen different branches. I was delighted to be paid the princely sum of £8.10s per week. Next, I worked in the workshops of Hodges & Johnson, the largest piano dealers in Essex, on piano tuning and repairs, but also became an electronic organ salesman / demonstrator, and secretary of their organ club. Their paperwork system for a single piano tuning involved ELEVEN items of paper and card, and they would not change, so I developed my own plan about how I wanted to do it. In 1971, I became self-employed as a piano tuner based in Walthamstow, and also ran a tuning department for Berry Pianos. I became an Associate Member of the Institute of Musical Instrument Technology. Membership of a trade association does not prove that someone can do their job properly, and even if they can, it doesn’t guarantee they will. In the end, you may have to depend on recommendations. I have always found that personal recommendation is more productive than expensive advertising, although one of my best investments was in tiny sticky labels to put inside pianos. "I danced with a man, who danced with a girl, who danced with the Prince of Wales"
Semprini’s London concerts were on my list of tunings. I did the preparatory tunings for Liberace’s London concerts, but I was concerned that the sostenuto pedal didn’t work very well. I shouldn’t have worried, Liberace said “I never use it anyway”. I used to be a P&O tuner! I tuned pianos on board various ocean liners, including Fred Olsen’s, but found it unnerving that the engine was always running, I kept looking out of the window to check that we hadn’t sailed. One of my customers had a fairly uninspiring thirties-style minipiano on which Charles Williams was said to have composed “Dream of Olwyn” for the 1947 film “While I live”. I bet that shatters some images of concert grands. When Procol Harum split up, I tuned the piano for the break-away group “Freedom”. They used to lift one end and drag the piano around, wearing away the bottom corner. My ears still hurt when I think of trying to tune while they were making loud noises. I was called in twice to tune pianos for comedian Arthur Askey, just so that he could sing his party piece “Busy bee”. The singing duo Mack & Katie Kissoon were regular customers. Their name was really Kassoon, but people kept getting the spelling wrong, so they bowed to pressure. I tuned a piano for recordings by the Royal Philharmonic Orchestra, and was choked when I couldn’t do another tuning for them the next day, because I had a big repair job booked. My customer was quite impressed that I turned down the RPO for her poor old piano! Hinge & Bracket were due to appear in a local theatre, and I was concerned about the horrible old grand, hand-painted matt black, and held together where necessary with 6-inch nails. They refused to play it, the air was blue. I used to tune the pianos for “Come dancing” but unfortunately, I didn’t get a chance to chat up Rosemary Ford. I rarely saw the celebrities for whom I worked. I tuned Rick Wakeman’s electric grand on stage, but he was nowhere to be seen, so I played his song “Guinevere” in a desperate attempt to get his attention. I packed my tools and headed for the door, but the theatre manager stopped me, and asked if Mr Wakeman had checked the piano. He seemed anxious, but Mr Wakeman shouted out from right next to where I had been working, and said it was fine… Not grumpy at all. I also tuned for BBC concerts in Essex, Chris Barber's band, Dave King, Kenny Ball & the Jazzmen, London's travelling Bubble Theatre, Victor Maddern, Peters & Lee, and Syd Lawrence. At a time when I had quite a full diary, I received a phone call from a rude, arrogant person who, having failed to impress me with his own name, proceeded to say that I should cancel other people and drive miles out of my way to fit him in, because he was a close friend of Cilla Black! Although George Formby lived in Norfolk, 2 of the grands I tuned for different people in Essex were said to have been owned previously by him, and (so the story went) only four notes were ever used, to tune his ukulele. Hmm! On one occasion, I was perched perilously on a platform high above the stage tuning while below, two comedians rehearsed a panto. They were so famous that their names escape me now. 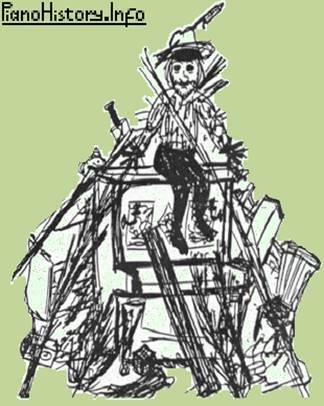 High perches were not that uncommon, piano tuners and musicians find themselves in some strange places. One job was on the edge of a very narrow stage in a bingo hall, and it was difficult to concentrate on tuning when I was more concerned about whether I would fall off. One of the pianos I tuned in East Ham was said to have been loaned to Winifred Atwell for a concert when her piano didn’t turn up, and was allegedly the beginning of her honky-tonk piano, or perhaps even the origin of that term, but it all seemed a bit far-fetched. I tuned pianos for a number of people in Dagenham, who LIVED IN BANJOS! That’s what they call a cul-de-sac with a circular end. Dudley Moore came from Dagenham, and I tuned several pianos, each of which the owners swore was THE piano on which the young Dud practised. Sandie Shaw was another Dagenite that people wanted to connect with their pianos. When I lived nearer to London, I used to look after the keyboard instruments at the Geffrye Museum, and it was interesting that the spinet held in tune better than the much younger pianos. When I was a young but qualified tuner, and looked younger than I really was, it was sometimes difficult to be taken seriously. Someone said “perhaps you should grow a beard” and after some thought, I gave it a try. It was strange when even my regular customers commented that the beard was in some way appropriate, in spite of the fact that I had never known a tuner who had a beard. There is no logic, but when something works, it seems sensible to stick with it. Of course, there are always people who take a dislike to beards, and one lady said I was hiding behind a disguise. I pointed out that it is the people who shave who are disguising themselves, and fighting against Nature. One man with a voice straight from Monty Python said “I thought I should answer the door, because my wife said there was a man with a beard coming up the path”! More recently, it has become fashionable for young men to grow a full set, as they did a century ago, but I wonder how many girls want to kiss a beard and moustache? My Gran said that you can’t trust a man who has a moustache and no beard, and that daft-sounding idea often seems surprisingly accurate. In my private life, I have to say I got more kisses when I shaved my beard off. In 1979, I moved to Benfleet, Essex, and set up a mobile workshop that could save customers a great deal money on major repairs, by bringing the workshop to them. The idea was a great success when they took advantage of it, but persuading people to spend on repairing old pianos is difficult, and the mobile workshop had to be abandoned. It is an historical fact that in 1982, I was proposed by Frank Holland for what was described at the time as “graduate” Membership of the Institute of Musical Instrument Technology, and this was awarded on the basis of my original research into piano history. I was entitled to place the letters MIMIT after my name, this was highly rated as a qualification, and if I had joined the armed forces, it would have entitled me to a commission. Coming out of 14 years of major illness, I contacted the institute on 3 separate occasions to ask about renewing my subscription as a member. Their response was that they had no record of me being a member, in spite of the fact that my name appeared for years in their membership lists, which I still have, and in spite of the various articles I published in their journals. I do not use the letters now, and have asked other people to remove them from their websites, but I have no control over them. It was a genuine qualification, and I do have the certificate, although the institute does not want me to show it here. By 1989, I had a shop in Lowestoft, and I wrote a fascinating computer program that could sort all my tuning jobs into months, days, and times of day. It could estimate appointment times by calculating mileage, and by allowing for the size of a job, it could also adjust the price scale and produce statistics. I have to say that I would rather have spent my life programming than driving a thousand miles a week. In 1990, I suffered a severe bout of glandular fever, which led to Chronic Fatigue Syndrome for 14 years and, sleeping up to 20 hours a day, I was unable to do any significant amount of work until 2004, when I RECOVERED and began trying to rebuild a living. I married Beth in 2002, and we moved to Great Yarmouth in 2007, when we thought we had a recording studio and a museum space. After 10 years there, we moved to Burwell, where (by the kind generosity of Wharton Agriculture Ltd.) we have a barn space for our museum. Without donations, I will be fine, but our collection may not survive. If every visitor to this site made a donation, we would have better displays in our museum building, and much-improved facilities for research within our own archives.